With the weather becoming warmer, I noticed the increase in bicycle riding. Whether people bike for exercise, recreation or commuting to work, over 26 million bicycles were purchased in the United States in 2005 alone. In 2007, more than twice the number of bikes were produced in the world than cars. To the tune of 130 million bikes were compared to 52 million cars. But with all the new bicycles being purchased, what happens to the old bicycles? Landfill or recycling? Is this your Bicycle Story? Do you own more than one bicycle? Do you use both bikes? Does your bicycle just take up room in your garage and is a home for spiders? Has your children out grown their bikes? If you wish to give away any of your bikes, consider recycling them. There are several organizations that would gladly take your bikes. Trashing them should never be an option. In addition, when P4P’s can establish an oversea partner, children and adults are trained in bicycle maintenance and repair. Bicycles that are repaired are then sold in the community fostering a local community. If you wish to start a bicycle recycling drive, make sure you read the collection guidelines. Due to the cost of shipping and repair, a donation of a minimum of $10 must be received with each bicycled donated. For donation collections in the Tri-state area, see here. Good Goes Around partners with bicycle shops, volunteers, and social services organizations to collect bikes, and give them to local children in need. You can donate your bicycles to certain bicycle shops in New Jersey and New York. However, if you wish to start your own chapter in your area, the organization can help you. Note, this is a young organization. Keep your eye on them. I suspect they will continue to grow since there is a need to give locally. Last year alone, the organization provided 1469 bikes to various social service organizations such as the Community Food Bank and Boys and Girls Bike Exchange. Recycle-A-Bike is a New York City not for profit community based organization that provide job training program and encourages everyday bicycle use. For more information about Recycle-A-Bike events, see here. BICAS, a Tuscon based organization, has trained thousands of youth and adults to repair, maintain, and ride bicycle through their various workshops. In turn, the organization has saved bicycles from the waste stream. In addition, the organization promotes the use of salvaged bicycle parts to make bicycle art. Check out some of their recycled bicycle racks. There were several great bicycle recycling programs that I did not mention. If you need additional sources then those provided above, check out the International Bicycling Fund. This website provides a comprehensive international list of where to donate your bike, donating bike parts, and organizations requesting bike mechanical training. 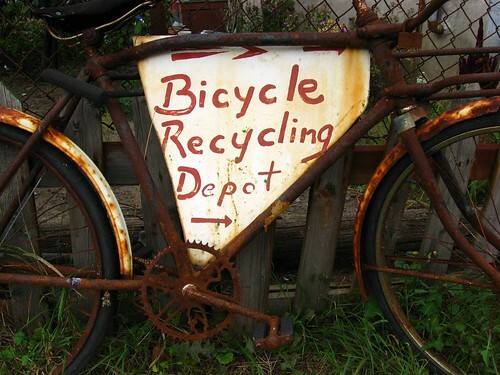 If your bicycle can not be repaired or its parts cannot be used, please deliver it to a scrap metal recyclers. Start your search at Earth 911. The scrap metal company that I use was not listed. So,you might need to “google” the term scrap metal recycling and your area to find the closet company. If your organization promotes bicycle recycling and/or helmet recycling, please list it below in the comments. Self-promoting is welcomed. No bicycle should ever be put in a landfill. Does your municipality or county government have a program for bicycle recycling? Have you volunteered to recycle bicycles? Donated one? How many bicycles do you own and do you use them all? What do you do with your bicycles? Do you make bicycle art? Great information! Once the snow melts (just got 5 new inches today!) I’ll look into some of these suggestions. We have so many bikes laying around. Thanks for sharing the information about various organizations for recycling bicycles. It is very important for all of us to understand the importance and benefits of recycling. I liked the idea of recycling bicycles. I really liked the idea of recycling bicycles. We all need to understand the effect of climate change on this planet and recycling is one of the way to reduce that effect. Great Post.